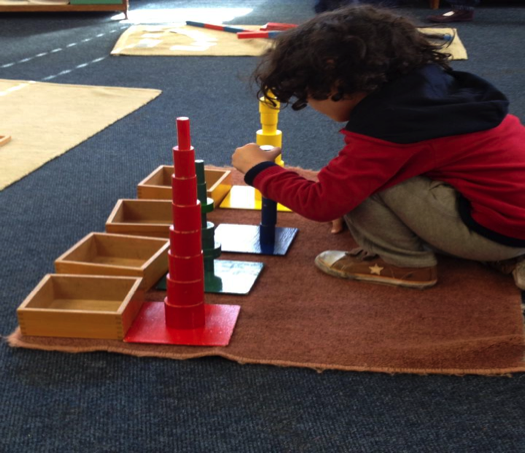 The Montessori Method of education, developed by Dr. Maria Montessori, is a child-centred educational approach based on scientific observations of children from birth to adulthood. 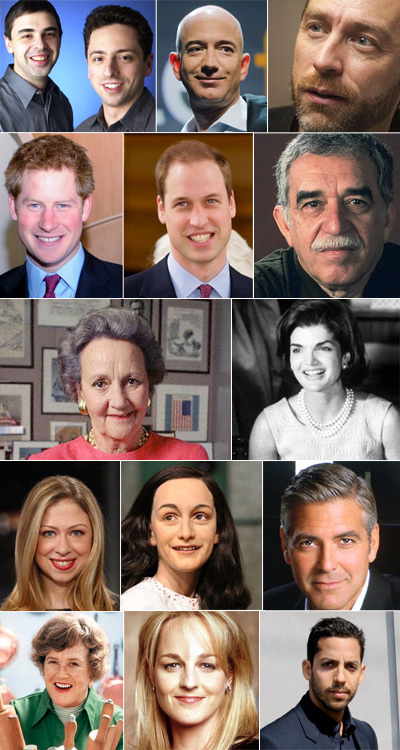 Dr Montessori’s Method has been time tested, with over 100 years of success in diverse cultures throughout the world. Students are part of a close, caring community. The multi-age classroom – typically spanning 3 years – re-creates a family structure. Older students enjoy stature as mentors and role models; younger children feel supported and gain confidence about the challenges ahead. Teachers model respect, loving kindness, and a belief in peaceful conflict resolution. Given the freedom and support to question, to probe deeply, and to make connections, Montessori students become confident, enthusiastic, self-directed learners. They are able to think critically, work collaboratively, and act boldly – a skill set for the 21st century. The learning materials in a Montessori school have been designed to provide a wide variety of learning experience geared to the developmental need of children. The activities involve handling and manipulating materials. This work has been proven to be intensely fascinating and absorbing for children. When engaged in well-structured tasks, the children experience a deep inner satisfaction, which leaves them with an overall positive attitude towards learning and school. In each Montessori classroom there is a mixed age group. This set-up provides the younger children with a graded series of models for imitation and stimulation, enabling them to see what they are working towards. Simultaneously, the older ones have the opportunity to help the younger children and reinforce their own knowledge at the same time. The Practical Life Area is designed to render the child independent of the adult. 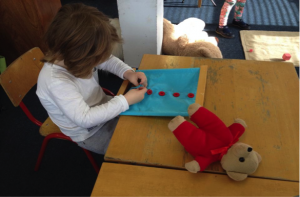 It also helps him/her to develop his gross and fine motor skills, hand/eye co-ordination and concentration as well as developing good work habits using material such as zips and buttons, orange squeezers, etc. The purpose of the Sensorial Area is to refine and sharpen the child’s senses in a very sensorial manner. 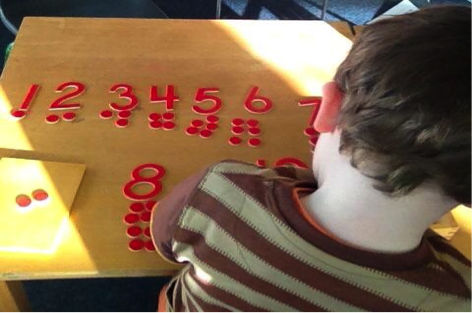 Many of the exercises in this area are also indirect preparation for later maths and language work, for example the use of the red rods and sound boxes. The principle of Arithmetic is that the mathematical concept is presented firstly in a very concrete form followed by the written version. The area covers an understanding of the basic numbers 1-10 and the entire decimal system through to the various mathematical operations of addition, subtraction, multiplication and division e.g. practice in forming numbers. For example the use of number rods, sandpaper numbers and hierarchy are taught through golden bead materials. The approach to Language is a phonetic one. The children first learn the sounds of the letter rather than the name. 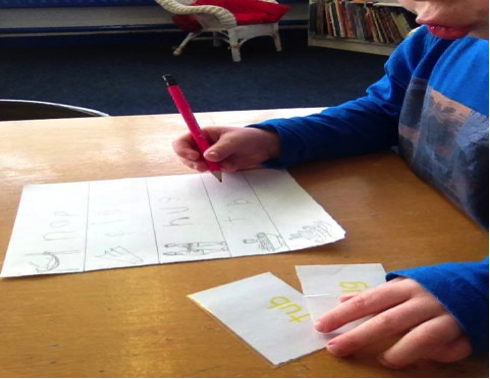 The development of their written and reading language skills is by means of various progressive exercises. 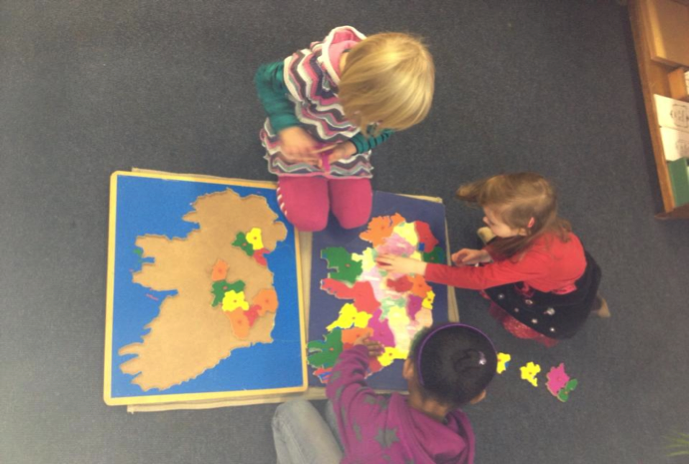 Irish is also taught to our children covering the national curriculum and focusing on oral Irish to start with. Finally, the Cultural area exposes the child to basic and fundamental knowledge in the areas of Geography, Botany, Zoology and History. They colour and label maps and country flags, learn the continents and counties of Ireland through jigsaws for instance.